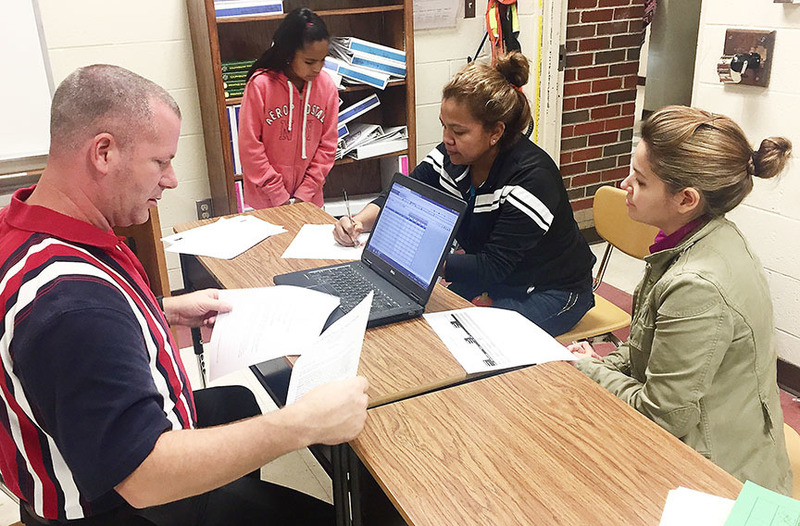 Joanne Mier (in front, right), an English Language Learner tutor, is pictured with Blytheville Middle School teacher Dennis Camp and a parent at the school’s Nov. 10 parent-teacher conference, translating the conversation from English to Spanish. This is a service provided by the Blytheville School District and available to any of the district’s families. Blytheville School District leaders have changed the way teachers meet with the parents to discuss the students’ grades and their progress inside the classroom. And after just a couple of conferences, the new midterm conferences are working well. Until this year, parent-teacher conferences were twice a school year at the end of the first and third quarters to discuss the report card grades the students had made. Moving the conferences to mid-term allows parents and teachers to conference in person rather than just get a paper progress report, according to district Curriculum director Sally Cooke. This earlier conference time informs parents of their child's progress while they still have time to work to improve their grades before they are turned in for report cards. Often it is the connection between the teacher and parent that can help a child make the appropriate changes to work habits that can help them become more successful. Amanda Haynes, Blytheville High School teacher, explained how encouraging the conferences are that parents can state how they themselves feel, and communicating that to the teacher and having that conversation gives them another opportunity to be involved in their child's life.